Posted Sep 28, 2018 by Eds. The third Pan-Africanism Today conference ended on September 23 with a rousing call to leftist organizations, trade unions and people’s movements in the continent to unite in militant and decisive struggles against imperialism and capitalism towards the creation of a socialist Africa. 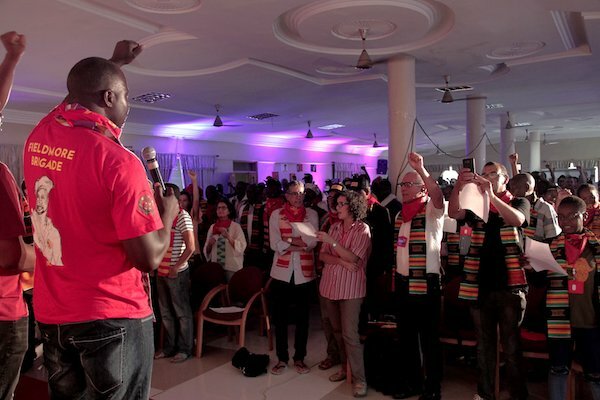 The conference in the city of Winneba, Ghana, was attended by over 400 delegates from 62 countries and saw wide-ranging discussions on ways to promote solidarity among the diverse organizations of the working class in the continent. The discussions focused on five key tracks: Battle of ideas; Urban/Rural struggles; Youth; Feminist struggles; and Trade unions. The discussions culminated in a series of draft resolutions, draft recommendations from five commissions that debated the tracks, and a draft declaration. All of these were further debated by the delegates. The discussions, draft resolutions and the entire conference were marked by a fierce recognition of the need for united efforts. Solidarity is not a mere word, was a common refrain, as the delegates overcame boundaries of language and culture to lay the foundations for common strategies. Ultimately, the delegates stressed the need for a concrete socialist program to take forward the Pan-African movement and made a call to fight capitalist ideology in all its manifestations. The need for education was emphasized in multiple discussions. From youth leaders to activists in the trade unions, many discussants talked about the vital role of planned political education in establishing greater coordination in the battle against capitalism. As Irvin Jim, general secretary of NUMSA, said, it was important to “educate both the old and young that workers’ rights are human rights.” The role of education in integrating urban and rural struggles and sharpening trade union and youth movements was also stressed. The role of education was also a key component in the Battle of Ideas. The process of decolonizing of minds, of rejecting the Western/European hegemony over African experience, was a multi-pronged process, delegates felt. This included the nuances of education but also that of the media. Taking control of the media of the continent was declared a key aim in the process to move the minds of the people of Africa. But the question before the delegates was also about the very structure of society itself. Integral to socialism in Africa is the issue of social formations, including the family. The discussants who considered the scope and importance of feminist struggles arrived at the need to ensure gender parity in all aspects, including on issues such as inheritance. A commitment was also made to ensure equity in all processes, including future conferences and structures of the attending organizations. The draft declaration reiterated the fact that socialism was the only way to both combat the exploitation of the people of Africa, and to realize the desires of the people for peace, land, education, employment. It noted the fact that these victories could be achieved only by finding common ground between specific struggles and called for greater interaction between movements in the continent. I think that we successfully brought the whole world into Ghana. Jim went on to add that the delegates had gathered to “revive our revolutionary credentials, to rekindle and to map a clear [a] way forward, and for pursuing class struggle as the only guarantee for change.” He pointed out that the conference had resolved to “collapse the fake borders”. “We have a duty and a responsibility to build one economy so that we can cut the stranglehold of being tied to the apron-string of our colonial masters…We wrapped up the conference with our spirit being revived to go and face our butchers in our different countries,” he added. The conference’s richness went much beyond its proceedings. Hundreds of interactions–formal and informal–saw delegates exchange the stories and struggles of their movements and contemplate the path ahead. The second day of the conference saw the delegates celebrate the life and work of Kwame Nkrumah, along with the people of Winneba. The representatives who spoke at that function paid tribute to him of course, but also hailed the fact that Nkrumah’s ideals were alive and thriving in the hundreds of militants that had gathered there from across the world. The evening of the third day was dedicated to the honoring of veterans–from Frantz Fanon, whose intellectual and political insight continues to shine light on the path ahead to Fieldmore Mapheto, a revolutionary field commander and an astounding political educator. The delegates honored Elharief Abdallah of Morocco, who had been jailed for his relentless and principled opposition to the regime of his country; and they honored the Polisario front and the people of Western Sahara for their decades of struggle against the very same colonial Moroccan state. G.A Balongun, Kojo Tsikata, the Cuban veterans in Africa–all these heroes of revolutionary movements were hailed amid the sustained cheers of hundreds of their political descendants. One of capitalism’s most devious strategies is the insistence that there is no alternative possible and socialism has failed. From September 20 to 23, at the town of Winneba, the voices of resistance from across Africa proclaimed yet again that another world was not only possible but inevitable.